Anyway, this is the starter I made to go with the date night. They were selling off end pieces of smoked salmon at a well reduced price, and I had some prawns already in the fridge. Whizz the salmon and fromage frais through a liquidiser until a smooth paste. Stir in the harissa paste, salt, pepper and sweeter. Taste and adjust the seasoning if necessary. Place the salmon mousse in shot glasses. 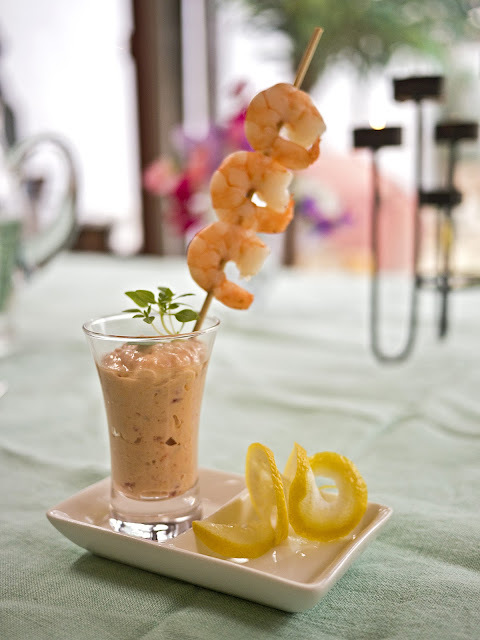 Thread the prawns on to skewers and place into the shot glasses. Decorate with lemon and serve.